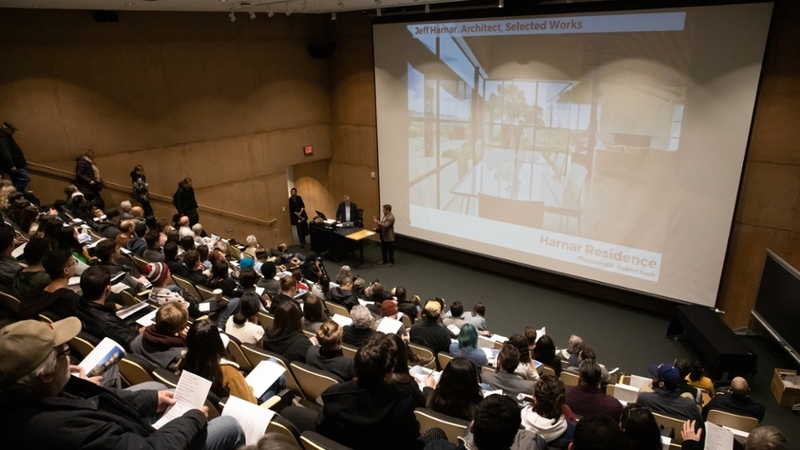 There was standing room only in the Garcia Honda Auditorium at UNM’s School of Architecture and Planning for the annual Jeff Harnar Awards presentation and lecture, sponsored by the Thornburg Foundation. Jurors chose the New Mexico Highlands University Trolley Barn as the winner of the 2019 Jeff Harnar Award for Contemporary Architecture in New Mexico, designed by Baker Architecture + Design. The subtle and sophisticated renovation of the historic building is helping to rejuvenate NMHU’s campus. Baker Architecture + Design, based in Albuquerque, received a $10,000 prize. This is the third time that the firm has won the award. The New Mexico Highlands University Trolley Barn marks the no. 13 winner of the award, which is given to a contemporary building completed in the last five years. The award honors the late Jeff Harnar, known for his groundbreaking design in contemporary architecture, mostly in Santa Fe. In addition to the contemporary architecture award, two other categories were also announced: Jeff Harnar Award for Unbuilt Architecture, and the Jeff Harnar Award for Unbuilt Landscape Architecture. The award for Unbuilt Architecture went to a team of four UNM undergraduate architecture students: W. Martin Joyce, Martin Luna, Jade Sheridan Moore and Jacqueline Smith. The winning project, ‘Marsborial Oasis Simulation System (MOSS),’ imagined the first human settlement on the planet Mars. The design jury considered to the project to be both visionary and practical. The Unbuilt Landscape Architecture award went to Jared Winchester of Entropic Industries and Cory Greenfield of CampoVerde Architecture, for their project ‘Wilding Towers.’ The project was part of a full-scale fake city for 35,000 people in Lea County, NM. However, the city will not have any inhabitants, but will instead by a site to test driverless vehicles, smart grids and other emerging technologies. The towers consist of a steel frame, compacted earth and seed blocks. As the blocks are eroded by wind and rain the looser inner seed mix is exposed and allowed to germinate on the surface of the tower and to propagate across the city’s surfaces. The jury chair and lecturer for this year’s Harnar event was Marc Tsurumaki, a principal at Lewis.Tsurumaki.Lewis (LTL) Architects in New York, NY. LTL has designed award-winning and notable cultural buildings such as the Telluride Center for the Arts in southwestern Colorado and the Arthouse at the Jones Center in Austin, TX. It also designed a variety of academic buildings at Vassar College, Columbia University, New York University, Gallaudet University, Claremont University and the College of Wooster. John Quale, chair of the Architecture Department at UNM, manages the awards and says the submissions this year were of such consistently high quality, that the jury had a difficult time determining the winners of the three categories. The Thornburg Foundation financially supports the awards. Congratulations to CRP grad student Sergio Lozoya for First Place at Emerging Researcher's National Conference in Washington DC!